What a busy busy weekend we have had!!! Ok, really it's been a busy summer. 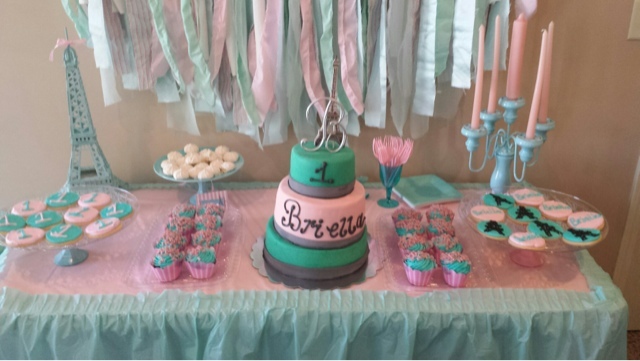 I have been planning, painting & pasting for months in preparation of celebrating Briella's 1st Birthday. We chose to celebrate her birthday 26 days early. Her actual birthday, October 4th is during RSV season which we will be in isolation for until next summer. 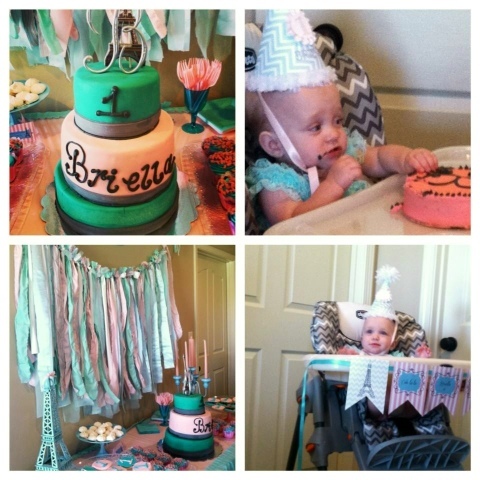 We wanted to have all of Briella's family here to celebrate with us the accomplishment of this 1 pound baby turning 1. For some of the family it would be the first chance to meet her! We started the day with a Re-dedication at church. 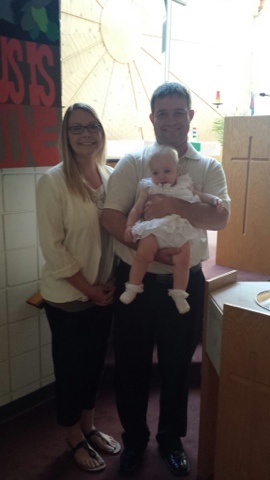 Briella was baptized hours after her birth in the hospital. My Pastor came to do the baptism in her isolete because we were afraid of what could happen. So yesterday was a joyous day. The family gathered and Pastor Rich made it a very special service for our family. He showed the picture of her on her original baptism day, just barely bigger than my hand. Now, I hold her and she is huge!! A whopping 17lbs!!! Immediately following the service we had a party at my parents home for Briella. Since this was mostly an adult party to keep Briella healthy, I searched for games that we could involve the adults in. I had all of the guests make guesses as to what Briella would be when she grows up. I placed 4 objects in front of Brie to see which one she would be drawn to-that object would represent what she would be when she grows up. It's actually a Korean tradition but I LOVE the idea. 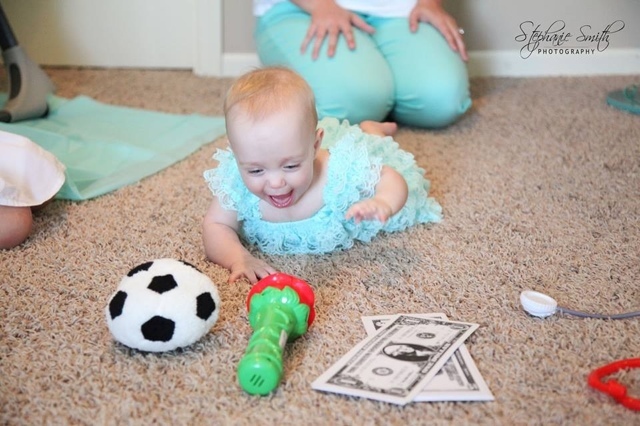 So I placed a stethoscope-which represents a doctor (I say she should become a Neonatologist to save other small babies), Paper Money to represent Wealth, a Microphone, which represents an Entertainer, and a Soccer Ball which represents an athlete. What do you think she picked?!?! Before I tell you, let me tell you that I put all these items on the floor, just out of her reach in hopes she would roll to the item she wanted. Well, in front of everyone, she starts to crawl towards the items!!! How cool her 1st time crawling was in front of everyone & being photographed?! Okay okay. So after the initial lunge for the Soccer Ball, a quick turn to the microphone and a two hand grab, she pulls it to her and tries to eat it. So an entertainer she shall be. Although I think she can be all the above. Especially a soccer player as this girl can kick! A second round she went for the money an was playing in it. And then in her high chair she played with the stethoscope, so we will have to wait and see. Wherever her journey takes her, it will be great. Full of lessons for us along the way. 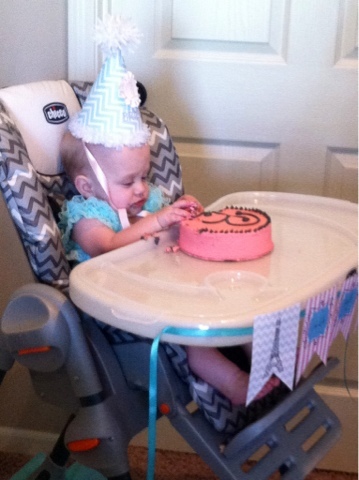 After the great career debate, we put her in her high chair and let her eat cake. Well, like a proper micropreemie, she oh so delicately touched the icing, barely getting any on her and licked her fingers. Daddy and I had to put her hands in the cake to get it started. I think she would have been happier just having us give her a bite. I hope this is not the start of the famous sensory issues that micropreemies are known for. We haven't seen any other symptoms before. After cake and lots of pictures, she opened presents! She did so good tearing into tissue paper. She ate almost every envelope. It was such an amazing day full of pure love. Just simple joy that my 23 week baby has still not come out of her "Honeymoon" stage the doctors waned us of after birth. If you remember, they told us over & over after the honeymoon stage, the 1st 48 hrs, she would take a turn for the worst. Then they said it sometimes lasts a week. Well thank GOD that we are still in that Honeymoon stage!!!! Tomorrow is Brian & I's 2nd anniversary. Last year on our 1st, we decided to share on this blog the name of our unborn child. What a year. On top of being thankful for my daughter's life & health, I am thankful for all of the people I have met on this journey. This is such an unexpected great community of people......other preemie parents, nurses that have turned to friends, doctors that are our heros, other kids that are inspiration and lots and lots of hope.